Over the years, I’ve gotten really good at packing. It helps that my dad travels a lot and has loads of experience packing for very long trips. When we traveled as a family we were never allowed to bring much; after all, there wasn’t enough room in the car for all five kids and a bunch of luggage. Dad used to tell me that when I got home from a trip I should evaluate the contents of my suitcase, notice what I didn’t really use or need, and keep that in mind the next time I traveled. Then Todd and I got married and started backpacking, which meant that every single thing we took along had to be carefully considered. We learned to pack as lightly as possible and to get by with the bare minimum. And now, when we travel, I can easily pack a month’s worth of outfits into a backpack or small suitcase, taking along just a few versatile, key pieces–with plenty of room left over for shoes! Those key pieces comprise what we call a core wardrobe. The core wardrobe is really trendy right now–I see everyone talking about it now, and I’ve talked about it before as well. 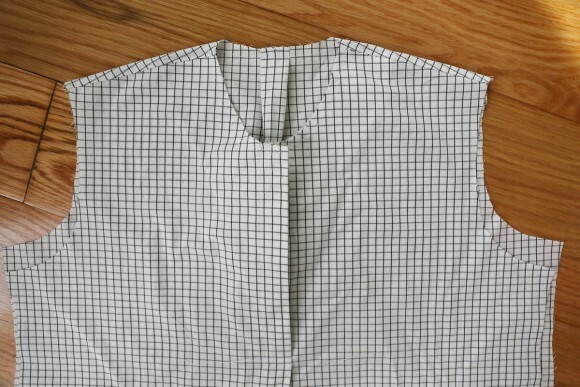 When I design clothing for sewing patterns, I think a lot about the core wardrobe. What are the pieces that you can wear over and over again, in a variety of ways, that will be really versatile and useful to you? But when we started talking about moving abroad for a year or more, I was a little nervous about packing a core wardrobe idea with a much longer time frame in mind. Packing for a week or a month is relatively easy. Packing for a year seemed a little more challenging! 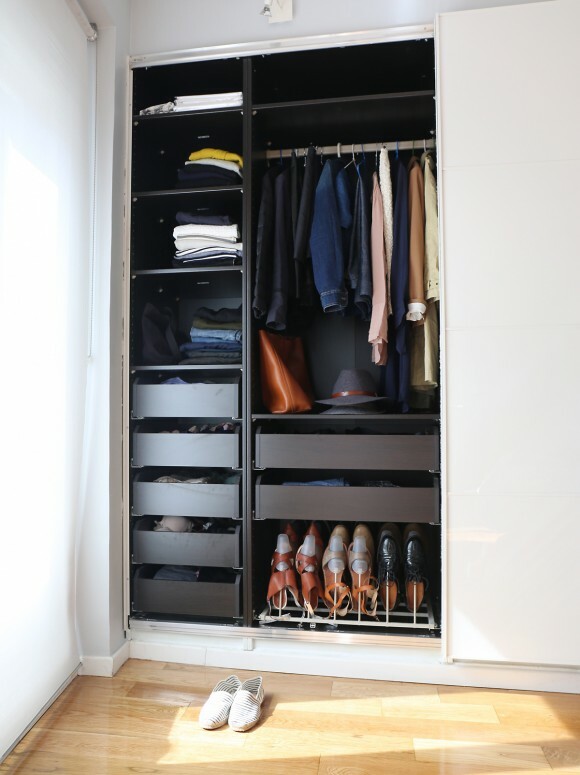 my closet and wardrobe: including two drawers of workout gear! In the end, however, it really wasn’t that different from packing for a month. I packed S and myself (Todd did his own packing) a core wardrobe for each season, with lots of cross-over between seasons. Plus, I knew that if we needed anything else I can certainly make or buy it. But though I really limited the number of clothes we brought along, we still have more than we need! Personally I brought 4 or 5 skirts, 2 pairs of jeans (which ended up being 3 because I needed something to wear on the plane), 4 trousers, culottes, 2 blazers, 2 jackets, 2 coats, 4 or 5 button-down shirts and blouses, 4 dresses, 4 or 5 sweaters, a bunch of short-and long-sleeves T-shirts, a lot of workout clothes (I was surprised at this category–but I do exercise a lot and actually wear all of them), and a selection of accessories like scarves and hats and shoes. (When we arrived I had 6 pairs of underwear, and then I found 2 more pairs hidden in the toes of my running shoes–do you do that when you pack?–so now I feel like I have more than enough.) Many of the items I brought are hand-made: lots of Gallery Tunics and Dresses, Maritime Tops, City Stroll Skirts, etc. Those items are my favorites because I’ve customize them precisely to my preferences. And they’re the most important items to me because they feel more personal. But here’s the surprise: I really enjoying living with less! I was afraid I would miss the clothes that I left behind, and I’ll admit there are a few things I wish I had taken. (I wish I had packed fewer T-shirts and had instead brought the shawl that my Grandma wove, which is like a security blanket to me.) But on the whole, I find that it’s much easier to get dressed in the mornings now, I spend much less time taking care of my clothing, and I’m not getting tired of my clothes at all. In fact, it’s just like I’ve heard people say: having few clothes allows you to be more creative with the clothes that you have. Todd and S have both mentioned that they’re really preferring having less, too. I’m making a conscious effort to keep my wardrobe small. I’m really motivated to keep it small, actually, so I’m not buying anything at all. I’m making a few items here and there that I know I’ll wear a lot, and I’m going to limit myself to the few hangers and drawers that I have so I’ll need to give away something if I make something new. And this minimalist approach is working for our family in areas beyond clothing, too. We are renting a furnished apartment, but it’s minimally furnished. We have beds and tables and sofas and a whole bunch of Spanish books, and the kitchen has dishes, a few pans, a microwave, and silverware. But we don’t have a blender, a mixer, or almost any kitchen gadgets at all. We also don’t have a TV. We have just enough sheets and blankets and towels for each of us (we’ll need to get more so we can have guests). S brought just a few favorite toys and books. And we love it! We spend much less time cleaning and straightening. The apartment is always neat (or much neater, at least) and tidy, and when I do laundry I enjoy caring for the few items that we have. I’m realizing that we need far less than we actually own, even though I’m really careful to edit our belongings in our small NYC apartment. And I have a strong feeling that when we get home we’ll want to get rid of a lot of our belongings. We just own too much. Right now I’m sewing a Gallery Dress out of fabric it took me ages to find: I had an image in my mind and couldn’t find exactly the right fabric to match, which happens to me a lot, actually. Now that I’ve found it I’m really taking my time making the dress, even though I’m eager to wear it. I’m making sure to sew everything just as well as I possibly can, using French seams and other little details so that when it’s finished I can really take pleasure in it and can wear it for a long time. I think that’s what Karen, of Fringe Association, was referring to when she proposed Slow Fashion October. (By the way, Karen has a lovely post today about week 2 of Slow Fashion October and featuring the Gallery Dress she’s sewn for herself.) It’s this idea of conscientious consumption. If you care to join in, you can do it on your own terms in whatever way you want. This week’s theme is Small, and I’m taking that them to heart with my small wardrobe. Which is still plenty big. Bigger than I need, really. And that’s part of the reason that many of us sew, correct? We can make conscious decisions about what we make, where it comes from, etc. But Karen does a much better job of explaining it than I do. Karen’s introduction to Slow Fashion October as well as her post for week 1. Marie Kondo’s book, The Life-Changing Magic of Tidying Up, which has captured lots of attention for its innovative approach to decluttering. I loved this article: Your Next Item of Clothing Should be So Expensive It Hurts. Yes! It’s really fun to look at #slowfashionoctober on Instagram! Also, S and I have been talking about how much we like living with less, and we’ve decided that when we’re tempted to buy something that might add clutter to our lives we’re going to take a photo and post it to Instagram as #whatilikedbutdidntbuy. Please feel free to join us! What do you think? Are there changes you want to make to how you buy or sew, how much you own, or other issues that this topic raises for you? Have you ever decided you have too much stuff? And have you considered joining Slow Fashion October? Your existence sounds wonderfully uncluttered. We got rid of most kitchen gadgets when we moved overseas five years ago, and now that we are back in the US, we find that we really are doing just fine without a toaster and a blender. (My Kitchen-Aid mixer, though, is a non-negotiable). Looking forward to reading more about your Spanish adventure. I like to feather my nest. Not so much with knicknacks, but with craft supplies, food and books/media but I am shocked and surprised that I have less clothing than what you took with you. Wow, I guess living in rural New England means I really do need to look a lot less glamorous than if I were in New York and Madrid, lol! Christina, as a fashion designer I probably have more clothing than a lot of people. I tend to wear and keep things for a really long time! Thank you Liesl for such a thought provoking article and further reading list. I have made a number of changes in the last few months to how I buy and sew clothes for our family. Planning our wardrobes in advance of each season certainly helps me to be more mindful of what we actually need. I have also set myself a few goals when it comes to purchasing fabric. Fabric shopping for a list of pre-planned garments is fine but I’m endeavouring to avoid impulse fabric buys. My local fabric stores offer free swatches so if a fabric takes my fancy but isn’t on my list then I will take a sample of it home to think about for a few days before I make a purchase. Your post was a very interesting read Liesl. Thank you! I recently did do a serious wardrobe downsizing and was relieved when I was done with it. Less choices, more of what I like–makes things so much simpler. Have you watched the documentary, “The True Cost?” The more I learn and see about the effects of fast-fashion on our world and on us as individuals and how we live our daily lives the more repulsed I actually become to the incessant march towards consumerism we can too easily get caught up in. We also live overseas, and move to a new country every 2-3 years and I am persistently asking myself, “do I need this? Why? Is it filling an actual void?” And, I’ve come to appreciate experience over stuff. Another effect I’ve noticed is that I value the time I spend planning and creating garments I sew for myself and my girls, so I therefore want that time to be woven, so to speak, of materials and processes that are in themselves satisfying. It means I sew fewer items, but they give me greater joy. Sarah, yes! We’ve become such consumers, haven’t we? I saw a really neat jacket in a shop this morning and was so tempted to get it–it was really unusual and very clever. But I already have two jackets–I absolutely don’t need another one. And I applaud your decision to sew with good quality materials. It’s so much more fun, isn’t it? I had a professor who always said, “Buy the best you can afford.” It doesn’t necessarily mean you have to spend a lot of money, but if you buy good quality materials you’ll be rewarded over and over, including during the sewing process itself. Good for you, Lindsie! And I completely agree about sewing a few clothes that fit and that you’re pleased with rather than owning a bunch of clothes that you don’t really like. Oh, and books are always going to be a problem for me. If I did the Kon Mari method, they’d all give me joy and I’d keep them all. I think I may need professional help in that area! It’s a wonderful eye opener travelling and living abroad. Last year we spent 8 months living overseas in a small apartment with three children. When we returned we felt overwhelmed by our big australian home, lifestyle and quantity of stuff. Our decision to sell and move close to the city into an apartment has been the best yet. We have more than halved our belongings and we have not finished culling yet. It is liberating in so many ways from less to clean….to more times for adventures. Many think we are insane, especially with three children but it needs to be experienced to be converted. I can’t wait to hear more. Spain sounds like a great adventure.